Re-registered and waited a day , no dice. Anyone got some advice ? Yeah same problem for me. RyanZombies is not being removed and CUP_Units is not being added. Altough its reported in the Query-Check Link. I will check the Launcher in 40 minutes. As an added piece of info, not sure if this helps. A3Launcher shows 1/100 - I only have 50 slots, and no players (ever) logged in. The issue is persistent - still cannot get my server on launcher, however the others are on fine. Still shows the dead server with 1 player, and the incorrect mods. Doesnt show right in the Launcher. 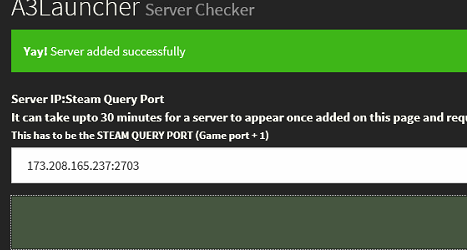 ok i have tweaked the back-end server, hopefully this should fix this problem permanently. Yeah looks like mods were loaded fine now. No problems for the last hour at least. I don't know if its unrelated but I'm having trouble loading into any server, even ones I played on just this morning. The launcher tries to directly connect to the server but it just sits on its respective loading screen endlessly (Let it try to sort itself for over an hour). It started when I tried to play epoch, and now when I'm in the server list the mods I'd enabled aren't matching the server I started for.